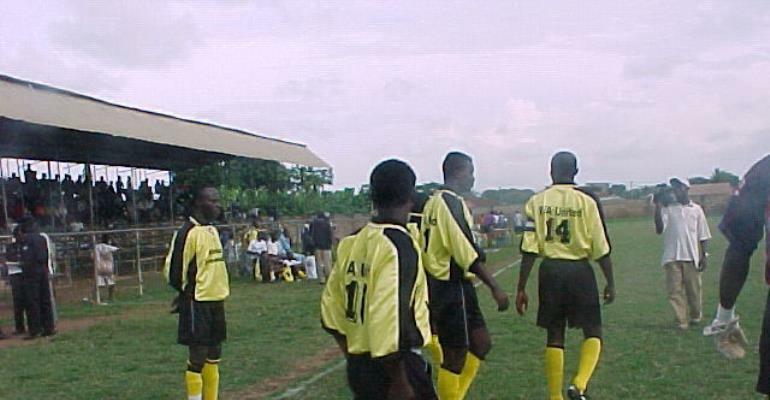 Accra, April 30, GNA - The Ghana Football Association (GFA) has announced the indefinite postponement of the of the 2004 Premier League that was scheduled to commence on Sunday, 2nd May at all the league centres. A Press Release signed by the Chairman of the GFA, Dr Nyaho Nyaho-Tamakloe the postponement of the league was due to a motion for interlocutory injunction filed by one Joseph Quarm, a supporter of Mine Stars FC to restrain the Association from organising the league until the final determination of an action he had taken against the Association at a High Court in Sekondi. Dr Nyaho-Tamakloe in the release copied to the GNA Sports said a new date for the commencement of the league would therefore be announced in due course. Meanwhile, the management of Prestea Mine Stars FC has in two correspondences to the GFA disassociated the club from the court case. In the first letter signed by Skedey Adams, Vice Chairman of the Club dated 3rd March 2004, the club called for extension of time for withdrawal of the supporter's case from the Sekondi High Court. The letter said, "We humbly ask this, for time given to us was short and on our part the journey is far. So we are asking for five days, that is Tuesday 9th March 2004. The Club followed up with another letter dated 4th March 2004 saying the management has taken the news as a blow when they heard from the media that they have taken the FA to court. The Vice Chairman said the management of the club have taken a firm decision that "We as a club have nothing to do with the case at the High Court of Justice at Sekondi in the Western Region." It continued "We state categorically that we disassociate ourselves with the action taken by one Joseph Kwame Quarm of H/No. MC/7A Prestea in the Western Region. The management added that, "We are also asking the plaintiff. Joseph Kwame Quarm to take immediate steps to withdraw the case to safe guard the interest of Ghana Football and also advice any future attempt of our loving funs".